E. tirucalli is endemic to Subtropical Africa, Madagascar, the Arabian Peninsula and India. This colorful cultivar was collected in South Africa. Euphorbia tirucalli is an excellent container plant. It does not mind being pot-bound. Where climate allows, it makes a very colorful landscape plant. Needs well draining soil. Note that the sap is somewhat caustic and the plant is best located away from pedestrian areas where the branches can be easily broken. The sap can cause temporary blindness if it contacts the eyes. Cuttings allowed to callus over root easily. 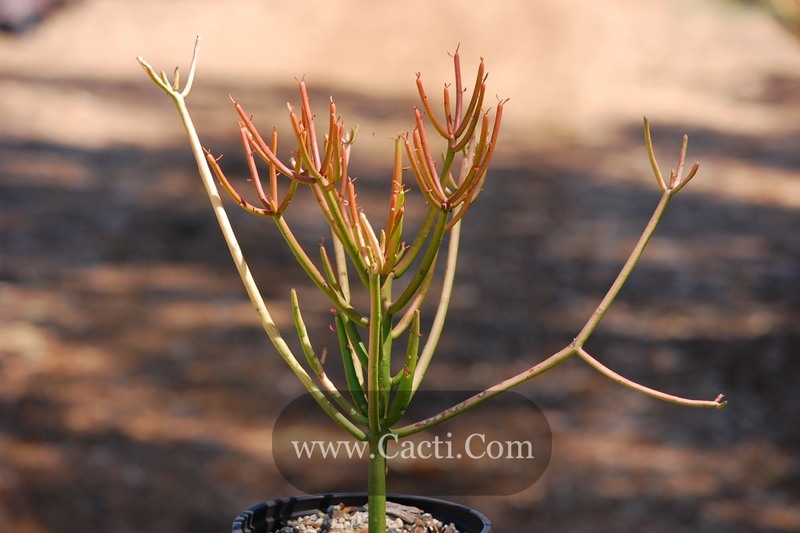 This cultivar of Euphorbia tirucalli is a very striking succulent shrub. Multiple fire-red stems, resembling small pencils or sticks, grow from the base of the plant. The red stems often show shades of pink, orange or yellow and the color is more vivid during the cooler months and when grown in bright sun. Inconspicuous yellowish-green flowers are borne in summer. Small leaves grow at the branch tips during wetter periods and are shed in dry periods. It is highly salt tolerant and can be grown near the ocean. E. tirucalli has been used in traditional medicine in many cultures for diseases ranging from tumors and warts to asthma, cough, earache, neuralgia and rheumatism, Modern chemical research reveals the plant does not help or worsens many of these conditions. Its sap is also used as a fish poison in Africa.